The entrance to Bryant Park remained barred Saturday. 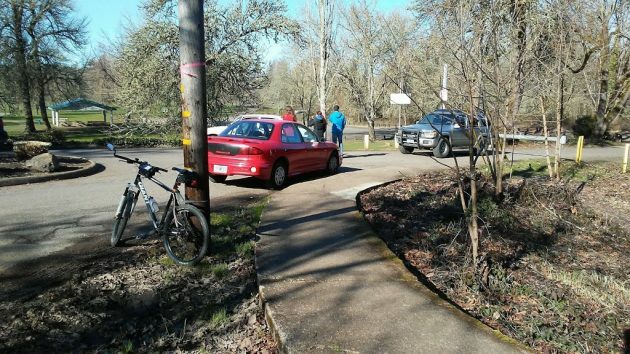 The park gates were closed on Feb. 25 because of rising water in the Willamette and Calapooia rivers. The weather turned fine on Saturday, but automobile access to Albany’s Bryant Park remained closed. That didn’t keep people from using the park for disc golf, time on the playground, or just walking around. They just left their cars outside the entrance, and outside the exit too. The city closed the park on Feb. 25 on fears of “high and rising water,” according to a public notice it sent out by the “Nixle” alert system. By Saturday, no flooding was in evidence. And the roads through the park were clear. But for some reason the gates remained closed. An American tradition that needs to happen more often. Civil disobedience – the peaceful refusal to obey a command of government. Give me park access or give me death. Perhaps city workers are not a available on the weekends . No kidding, everyday is a holiday for this work group! I have to go with the city on this one. They seem to be going with a calculated risk. The big issue is the huge snow pack above us, or south of us in this case, somewhere around 117% of normal, and it doesn’t take a lot of rain to release that. If you want to go around the sign that’s fine, but you can’t come back to the city (and the insurance company) with your attorneys and say “You should have known”. People is just the worse. For goodness sake, there is a street above Bryant Park with plenty of parking space that is a maximum of 3 minutes walking to the park entrance. Can’t they just walk a little bit instead of leaving their cars around the little roundabout?